The Big Bang Theory: "The Boyfriend Complexity"
One of the best things about a multi-camera sitcom, filmed before a live studio audience, is that accidents can happen. Oh, sure, accidents can happen in single-camera sitcoms, but if someone flubs a line or knocks over a piece of the scenery or something, it's usually more tempting to go back and get another take. When you've got the audience there, they'll often react to that accident, and that reaction can persuade the producers that what happened was actually funny, even if it wasn't in the script. That sense of spontaneous creation, of the audience being involved in the process of writing the show, is rarely possible on a single-camera sitcom, even if that form is normally much less regimented. And so it is with tonight's Big Bang Theory, where one of the biggest laughs from the audience comes from something that wasn't planned to happen. Leonard arrives home from a final meeting with Penny and her dad (the ever jovial Keith Carradine), in which her dad has begged him to keep trying to win her heart for good. (And since this is a sitcom, and both Howard and Sheldon have now been presented with appropriate life-mates, we're pretty damn sure Leonard will eventually succeed in this quest.) Leonard had been pretending to be Penny's boyfriend so that she might convince her dad she was at least doing SOMEthing to his liking. All of her other boyfriends had been the kinds of guys you don't want your daughter hanging around with, but Leonard, well, Leonard was a nice young man who worked as a scientist and had graduated from college. Leonard was son-in-law material. Leonard was father-of-your-grandchildren material, at least in dad's eyes. Anyway, eventually the ruse is up and dad finds out that Penny and Leonard were lying to him, and he asks Penny just why she didn't trust him to accept her as she is. Of course, as soon as Penny leaves the room, dad begs Leonard to keep working on Penny. He really likes Leonard with her. He really likes video game fishing with the guy. And despite the fact that Leonard got a little too into the idea of over-dramatically kissing Penny when they were just play-acting at being a couple, he's still the best boyfriend she's had, in her dad's eyes. So that's gotta count for something. Leonard goes home after this unlikely pep talk to find Sheldon emerging from the back with the revised roommate agreement. Sheldon saw Leonard and Penny kissing, thought that everything was back to the way it was last season, and became dismayed. Nevertheless, he wants his friend to be happy, so he goes back into the apartment to put the finishing touches on the new Penny section of the roommate agreement. Which is where we came in. 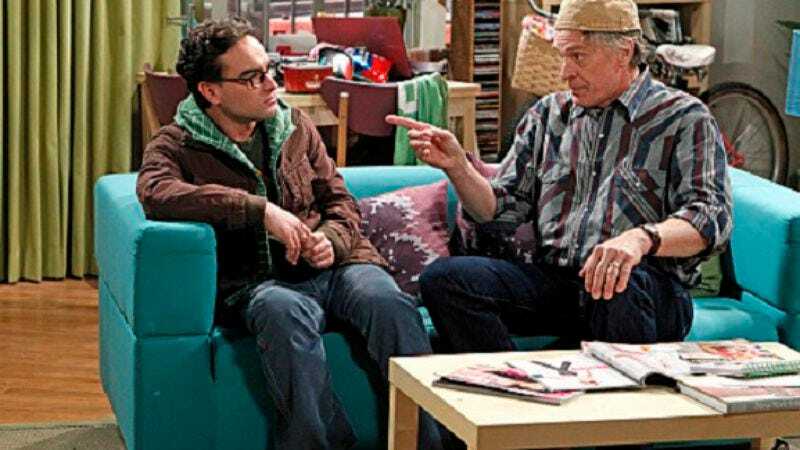 As Sheldon begins to outline what he's done to Leonard, Leonard explains that, oh, he was just playing along with Penny's ruse for the benefit of her dad. Sheldon, irritated, throws the papers in the air, where they drift all around him. As they return to Earth, one sticks to Sheldon's head, confirmed to be a total accident by co-creator Bill Prady on Twitter. It's not that the sight of this is especially hilarious or the fact that the dialogue is all that unexpected (it boils down, basically, to Sheldon asking Leonard why he never thinks of anyone ELSE'S feelings). Somehow, though, the incongruity of having both happening at the same time becomes something very, very amusing, as does the fact that the audience, who'd probably seen a take or two of this scene and realized this was an audience, seems amused by the very fact that something unexpected and new has happened. It introduces a sense of edge to their laughter, which Jim Parsons pushes through. As he whirls to return to his room, the paper flies away from Sheldon's head, and the whole thing gets even sillier. It's not a great gag, but that element of the unexpected does liven up what was, otherwise, a pretty uneven episode. It's notable that this is really the first episode of the season to NOT feature Sheldon to a distracting capacity. It's pretty much a Leonard and Penny arc advancing episode, since the show has decided it needs to have a Leonard and Penny arc at this point. Last week, Penny admitted that her feelings for Leonard were never totally dead, and he just wanted things to go quicker than she wanted them to. This week, when confronted with her dad being in town, she wants to pretend that he's the guy for her. (I'd say she's motivated by the question last week of whether Leonard will still be into her once she's ready for him again, but that kind of continuity isn't often the show's strong suit.) Leonard and Penny stories are often hit and miss, but this one was blander than usual. I enjoyed Carradine, particularly the way he just settled into the guise of a good-ol' Nebraska guy, but the way that Leonard took such pleasure in Penny's ruse was, frankly, kinda creepy. Meanwhile in the other storyline, Melissa Rauch continued to show why the producers had such good sense in promoting her to a regular. She turns every line into such a little optimistic bundle of joy that it's hard not to be amused by, say, the idea of her accidentally coating glasses in incurable diseases. Now that the show has more or less paired off Sheldon, Howard, and Leonard, it seems to be turning its eyes toward finding a love interest for Raj. Since Raj is the most underused member of the original cast, this is probably a good idea, but tonight, it mostly consisted of moping. Then, he kissed Howard accidentally, after trying to kiss Bernadette, and I guess it was a big deal for a certain section of the audience that politely titters at the scenes where Raj and Howard are played more as a gay couple than as good friends. And, look, I'm not against this kind of humor or anything, but the show really oversold the joke, between the big, bugged-out eyes on Howard's face and the slow-motion. It didn't need that hard of a sell, honestly. So that's this week's Big Bang Theory in a nutshell: Some funny moments, some good line deliveries, a nice moment of spontaneity, and then a bunch of other stuff that was just kind of there. On the one hand, I'm glad the writers are telling stories about the other characters, and I'm always glad to see Melissa Rauch get fun stuff to do. On the other hand, seeing the show go back to the Leonard and Penny well kinda makes my head hurt. If the show wants the two of them together, it should just get them together. They're not a TV romance for the ages, and the more the series tries to pretend they are, the more ridiculous it seems. I asked on Twitter if comics fans ever really get out their comics and go through all of them with such obvious affection, and it turns out that they do. And to think I was going to complain about that! On the other hand, do the geek references occasionally feel more obligatory this season to anyone else? It often just boils down to comic book comic book comic book, science fiction movie, and the references rarely push beyond the most obvious ones. Granted, that's probably an offshoot of the show's growing mainstream popularity. It's pretty weird to think of Penny's dad being Wild Bill Hickock. "Wolverine's never showed the slightest interest in helping other's prevent prostate cancer." "Don't get me wrong. I love your new stuff, but sometimes it's nice to hear the hits." "You don't have a neck tattoo or outstanding warrants or … or a baby!" "Get over yourself. I whistled, you came running." "I was working with penicillin resistent gonnorhea in the lab today, and I was just trying to remember if I washed my hands." "I'll friend you on Facebook!" "You get to play with Raj's big telescope last night?"